This inviting, one bedroom cottage is a 1930's gem. 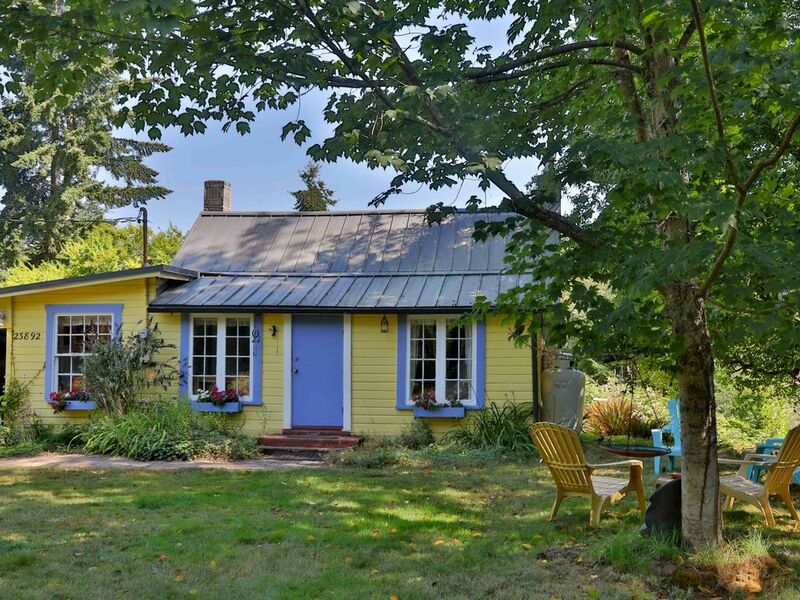 Located between Freeland and Coupeville on South Whidbey Island, the Artists Cottage offers privacy and unique blend of rustic elegance on 13 acres of fields, woods, and wetlands. Especially intended for longer stays, there's a well equipped kitchen, original art on the walls, and the delightful rooms boast color, texture, and warmth. Inside there is an automatic gas fireplace, a claw-foot bath tub, while outside you can enjoy a hot tub on the back deck overlooking the wetlands and forest. The pond in the front yard is regularly visited by ducks, herons, and even deer. The beautiful Meerkerk Rhodedendron Gardens are a short walk away and the historic town of Coupeville and incredible Ebey's Prairie are a short drive to the North. More antiques and artwork can be found to the south in the village of Langley. We raised our two boys on Whidbey Island for 18 years,while George taught school and Nancy ran a cafe. When we decided to expand our horizons, we realized we could not part with our cottage at Greenbank. It is such a special place. We added a larger bedroom, decks and hot tub, and visit as often as we can. It is a great pleasure reading the guest book, and sharing a favorite place on the planet with others. We have owned this 1930's cottage for many years before we decided to turn it into a vacation rental. It is rare to have such privacy and 13 acres of woodlands, trees, wetlands, and meadows, all to oneself, with of course, the deer, rabbits, ducks, and birds that we share it with. It is a fantasy come true... Private lush life surrounding a darling cottage, decorated with art from the Pacific Northwest simply nourishes the spirit! And a live animal planet channel right out the window! If you are into luxury, this is not the place for you. But, if you're not into material things, and into eclectic vibes and art, and you want that nostalgia of going home to grandma or grandpa's place, this is a cool cottage. Things are well-worn (bungee cords and a few cracks), but almost everything is working, including the nice hot shower! It's small and cozy, as a cottage should be. And the acreage had my dog smiling the three days we were there. There are geese, birds, rabbits, and lots of frogs. It was all nice to sleep to. This is definitely an artist cottage in the truest sense of the word. And the owners are very responsive. Thanks for sharing the cottage! Very peaceful, great place to recharge. Our weimaraner had the best time playing in the yard and chasing the critters. Such a great spot for people who like to bring their dogs along on vacation. It was nice to have the gate there so we could shut it and not worry about the dog venturing out. Hot tub worked fine, but it cools off and won't heat up unless you get out and put the lid back on. That's when you go stretch out on that comfortable king size bed and turn the Roku on and watch a show while it heated back up. I appreciate that we didn't have 10 pages of check in and check out rules that some places have. We brought enough food along and never made it out once we got there. That cute little stove cooked up a tasty loaf of banana bread, and the little cast iron pan made for some tasty steaks. Very close to downtown Seattle, so if you need a break from the city, this is a great little place to stay. We would love to come back very soon! I think she's ready to go back! Thanks again for sharing your cozy cottage. We loved this quiet little hide away!! We loved this charming little get away. The house was amazing and loved the hot tub to relax in each night. And all the little bunnies that visit each night. Thank you for sharing this secret hide away. It was perfect for our 21st anniversary. What a real blessing it was to be able to visit this lovely home for the 2nd time. My husband and dog just had the best holiday here. The property has been well kept and the landscape is unreal. You have acres of trees, wildlife, and flowers to engulf you in privacy. This time we saw deer, owl, and eagle almost every day. Hummingbirds visited the feeder by the hot tub like clockwork while we grilled or soaked at night! Inside was clean and decorated with a fabulous collection of one of a kind art. Stuff like a shadow box full of knickknacks from the owners travels and neat decor like multiple funky teacups or duck statues of different sizes. Their Roku and incredibly comfy bed made it so we hardly left the property this time! It is also an ideal spot to unwind and explore Whidbey Island from! Short drive to Freeland for groceries and Whidbey Coffee! Super close drive to Greenbank Farm too. Finally, the owners are wonderful with communication, offered great recommendations, and made the entire process easy. Because of them we visited Double Bluff Beach with our dog and had such a good time. I could write more but thank you to the owners for sharing such a special place and we will be back! It was our pleasure to host you, your husband, and dog again. We love that you fell in love with our home and property enough to return and still found it comfy, clean, and enchanting. It really is a pleasure to share our place with you and love the appreciation you have for our home. We look foward to having you back again! A wonderful obviously well loved cottage. Beautifully appointed with interesting art and pottery with large yard and great blackberry bushes. Hosts were available for any questions. Good location, secluded from nearby highway. Highly recommended for a easy getaway from Seattle! Thank you for your kind words. We are so glad that you and your family enjoyed and appreciated the cottage as much as we do. Our pleasure to host you, thanks for your communication and taking care of our home during your stay. Safe travels home! The property is just as advertised: quiet, tranquil, lushly vegetated, and very private. The cottage itself has a lot of character: expressive art, variable ceiling heights, and rustic but comfortable furnishings. Courtyard by Marriott it’s not, and that’s just the way we like it. The hosts couldn’t have been more responsive. The only thing that disappointed us about our trip was not under their control: apparently the Greenbank Store has closed permanently. So we had to travel a little farther than we’d planned to go out to dinner. Regardless, we’d recommend this property to anyone who’s looking for a tranquil and private country getaway. Sorry for so long to respond...Thank you so much for your review! And..news...Greenbank now has 2, count 'em! cafes to eat at! And...drum roll please...the Greenbank store says they will reopen soon! We hope you will return soon!